This is a full-sized 36mm. 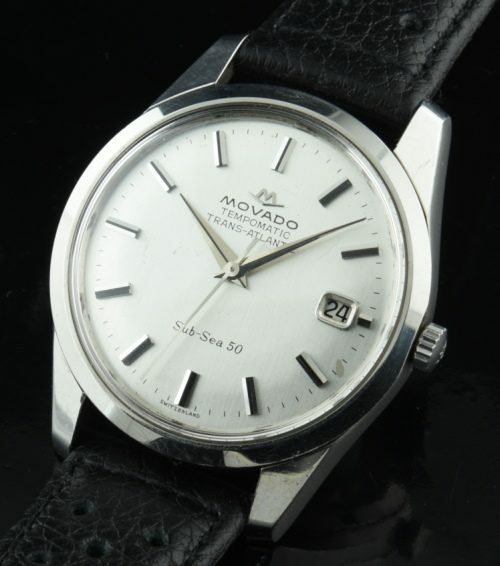 stainless steel Movado Tempomatic Trans-Atlantic Sub-Sea 50 from the 1960’s having a large looking stainless steel case, Dauphine hands and original silver dial and baton markers. This watch has the original winding crown. The fine automatic winding movement was just cleaned and is accurate. The minor age mark on the dial is not detracting. Notice the large beefy lugs. I must say… this watch looks fabulous on the wrist!